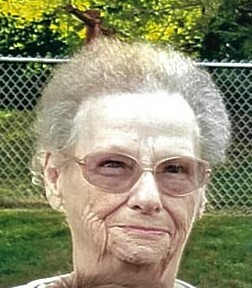 Beverly Blanche Lawson, age 84 of Toronto, OH passed away Sunday, March 24, 2019 at her home surrounded by her loving family. She was born October 15, 1934 in Toronto, OH the daughter of the late Clarence and Anna L. (Fisher) Prosser. Beverly was a member of the Toronto Church of the Nazarene; was a member of Welsch’s Bowling Team in Toronto; was a 1952 graduate of Toronto High School and had been formerly employed by the former G.C. Murphy 5 & 10 Store in Toronto, OH. Besides her parents, she was preceded in death by her husband, James C. Lawson in 1998 whom she married May 4, 1957; brothers, Clarence J. “Frog” Prosser and Eugene W. “Jeep” Prosser and a sister, Frances Grose. She leaves behind her sons, William E. Lawson of Toronto, OH and Mark (Robin Barney) Lawson of Syracuse, IN and a daughter, Mary Ann (Charles) McGee of Toronto, OH. Four grandchildren and four great-grandchildren survive. Visitation hours for Beverly will be held from 12 noon to 2 P.M. Friday, March 29th at the Clarke Funeral Home, 302 Main St., Toronto, OH followed by a celebration service of Beverly’s life at 2 P.M. at the funeral home with the Reverend Eric Frey officiating. Interment will follow at the Island Creek Cemetery. Memorial donations in Beverly’s memory may be made to the donor’s choice of a charity.